Day 1: Nimrod to Buq´ata. Start at Nimrod, a small village on the slopes of Mt. Hermon and a perfect introduction to the trek region and beyond. The trail snakes through a pastoral landscape with a diverse and distinctive character, the scenery is of limestone and lava, Druz villages, apple orhcards, oak forest and more. 14Km, 5.5Hrs. Day 2: Buq´ata to Merom Golan. 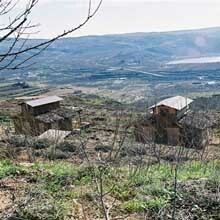 Start at Buq´ata and walk south along the main road of the Golan Heights. Continue in an easterly direction and through the dormant volcano of Hermonit where a beutifull panorama viewpoint complets yesterday´s view from Odem hill. Take your time and enjoy the day. It is a slow and easy walk thanks to the low gradient plains created by the lava flows. Water reservoirs, apple and cherry orchards line the walk to Kibbutz Merom Golan. 13Km, 5Hrs. Day 3: Merom Golan to Ein Zivan. The day 3 trek is short and relaxing, so you can afford a late start, enjoy the substantial breakfast and take a tour around the kibutz where in spring you might be lucky enough to see the cherry trees in blossom. Start at Kibutz Merom Golan and climb up to the dormant Bental volcano - the highlight of the day. It is the right time to relax and enjoy the spectacular view all around of the Golan Heights, Mt. Hermon, upper Galilee and the Hula valley. While descending from Bental, discover the various shapes of the lava rocks. The trail leads to Kibutz Ein Zivan accommodation. 9Km , 4Hrs. Day 4: Ein Zivan to Alonei Habashan. Start from Kibutz Ein Zivan through the natural wood south to the cow herding plains and fields. Walk through the hill of the wind turbines farm and along the flow of water from the spring down by the religious moshav (village) of Alonei Habashan. Inside the village is the accommodation. 15Km, 5-6Hrs. Day 5: Zavitan stream trek. The day 5 trek is somewhat more challenging than the first 4 days. This part of central Golan is characterized by a number of rivers flowing down to the Beith Saida lagoon and into the Sea of Galilee. A short transfer from Alonei Habashan will drop you off at the trailhead point. The walk is in and along the Upper Zavitan Stream which undermines layers of lava creating unique and unexpected landscapes. The Hexagon Pool (Hebrew: Breichat HaMeshushim) is a real highlight close to the end of the trek at Hadnes. 14Km, 6Hrs. Day 6: Gamla to Um El Kanatir. A glimpse at history is what the day 6 trek is about. A transfer from Hadnes will drop you off at Gamla where you will find out about the hopeless struggle waged by Jewish rebels against the Roman army. The end of the battle, it seems, was when the fighters and their families jumped to their deaths to avoid capture. A visit to Gamla leaves you with a good impression of the day to day nature of jewish life in the period prior to the revolt in the first century A.D.
Day 7: Giv´at Yoav to Ein Gev. Starts in the beautiful Ophir viewpoint over the Sea of Galilee. The trail, meandering down to Ein Gev, passes through old settlements and landscapes of lava and limestone with full view of the Kinneret (Sea of Galilee) throughout the entire trek. 12Km, 5Hrs. In this trip, as in all others, you choose how you want to shape your walk to suit your ideas, your available time and your budget. We can plan a trip of days 1 – 4 for you in the upper part of the Golan Heights. Weather conditions are ideal from the beginning of February to the end of November. Alternatively you may consider doing the route of days 4 – 7 which we recommend from mid-September to mid-June. In either case you are welcome to discuss your preferences and abilities with us. We can tailor the choice of walks to suit your specific requirements. All offers are subject to availability. 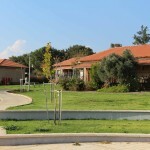 The humble guest village reflects quite accurately the modest way of living of Alonei Habashan community. It is a jewish religious community in a form of settlement that is somewhat between kibutz and farm village. Imagine, after a long day walk, lying in a hammock overlooking the Sea of Galilee, between trees with the sound of birds and running water. It isn´t a dream. This is in reality the experience in Miri´s ecological B&B. A beautiful suits complex planted in the heart of a peace and quiet place, against the hypnotic view of the KINNERET, Sea of ​​Galilee, and the Jordan highlands. Rina´s hospitality is very well known at the village of Giv´at Yoav not just thanks to Rina´s personality but also to the wooden cabins she so wisely and stylish built at the farm yard close to her house. 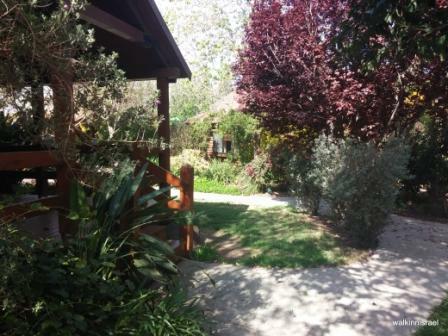 The meeting with Tami and Yifat smilig and welcoming you at their cabins in Moshav Neot Golan will immediately make you feel at home. Not unreasonable is that you will give up the next day trek after Tami´s fabulous breakfast. The perfect location for calm and relaxing break at the finale of the trek and just before starting the way back home. 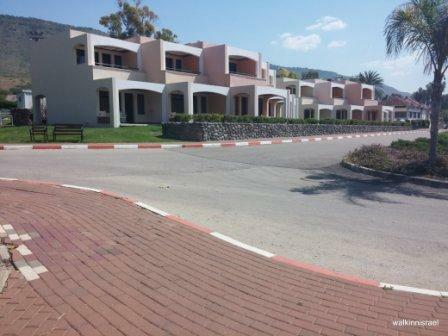 The resort is located at the shore of the sea of galilee and the bottom of the Golan Heights. Seat back, enjoy the view, the lake and the food. Want to prolong your stay at the resort? ask us for the details.